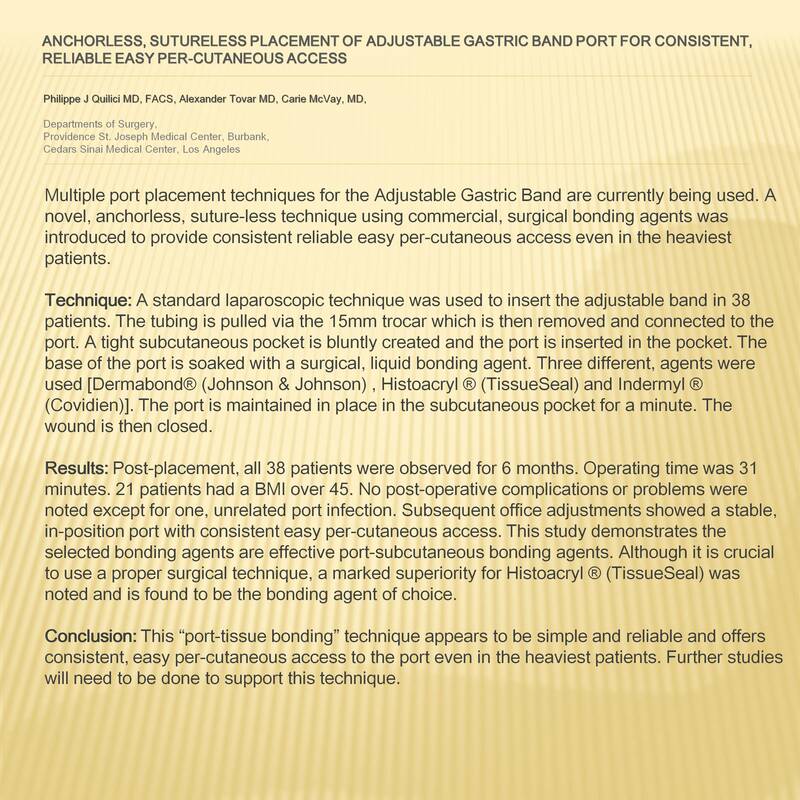 Anchorless, Sutureless Placement of Adjustable Gastric Band Port for Consistent, Reliable Easy Per-cutaneous Access. Multiple port placement techniques for the Adjustable Gastric Band are currently being used. A novel, anchorless, suture-less technique using commercial, surgical bonding agents was introduced to provide consistent reliable easy percutaneous access even in the heaviest patients. Technique: A standard laparoscopic technique was used to insert the adjustable band in38 patients. The tubing is pulled via the 15mm trocar which is then removed and connected to the port. A tight subcutaneous pocket is bluntly created and the port is inserted in the pocket. The base of the port is soaked with a surgical, liquid bonding agent. Three different, agents were used [Dermabond (Johnson & Johnson) , Histoacryl (TissueSeal) and Indermyl (Covidien)]. The port is maintained in place in the subcutaneous pocket for a minute. The wound is then closed. Results: Post-placement, all38 patients were observed for 6 months. Operating time was 31 minutes. 21 patients had a BMI over 45. No post-operative complications or problems were noted except for one, unrelated port infection. Subsequent office adjustments showed a stable, in-position port with consistent easy per-cutaneous access. This study demonstrates the selected bonding agents are effective port-subcutaneous bonding agents. Although it is crucial to use a proper surgical technique, a marked superiority for Histoacryl (TissueSeal) was noted and is found to be the bonding agent of choice. Conclusion: This “port-tissue bonding” technique appears to be simple and reliable and offers consistent, easy percutaneous access to the port even in the heaviest patients. Further studies will need to be done to support this technique.